Whoever you may be who still desire the first place here—go and sit in the last place. Do not be lifted up by pride, inflated by knowledge, elated by nobility, but the greater you are, the more you must humble yourself in every way, and you will find grace with God. In His own time He will say to you: "Friend, go up higher," and then you will be honored by all who sit at table with you. Moses sat in the last place whenever he had the choice. When the Lord, wishing to send him to the Israelites, invited him to take a higher place, his answer was: I beg you, Lord, send someone else. I am not a good speaker. It was the same as saying: "I am not worthy of so great an office." Saul, too, was of small account in his own eyes when the Lord made him king. And Jeremiah, similarly, was afraid of rising to the first place: "Ah, Lord God," he said, "look, I cannot speak—I am only a child." In the Church, then, the first seat, or the highest place, is to be sought not by ambition but by humility; not by money but by holiness. Bruno of Segni ( died 1123 AD, bishop of Segni, great commentator on scripture who helped Pope Gregory VII in his reform of the Church. 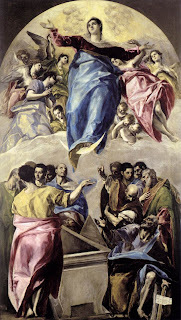 On August 15, the piety of the Catholic devotees honors the Feast of the Assumption. This is holy day of obligation in the United States. 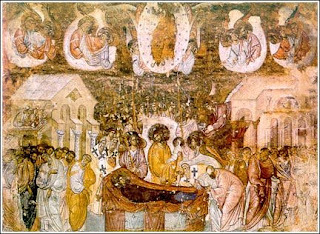 It is the most ancient feast of Mary but its origin is unknown. 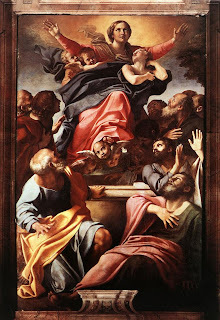 The feast of Assumption completes God's work in Mary since it was not fitting that the flesh that had given life to God himself should ever undergo corruption. 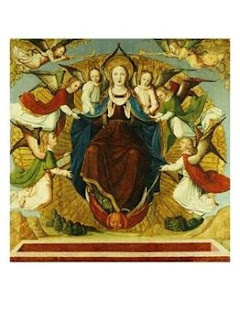 The Assumption is God's crowning of His work as Mary ends her earthly life and enters eternity. Mary had been taken up, body and soul, into heaven. 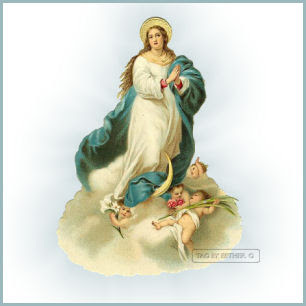 Source St. Michael Center for the BVM, Honolulu, HI Please visit their site and you can find Assumption Day traditions as well as other interesting articles on the Assumption. 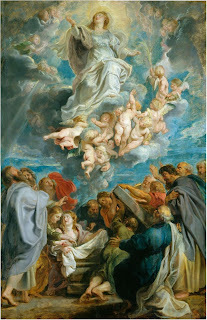 This week we will spotlight famous artists' depictions of the same theme, the Assumption of the Blessed Virgin Mary into Heaven body and soul. How are husbands to love their wives? What is the hierarchy of the family? Is the wife then the slave of her husband? But is not this subjection of the wife to her husband against her human dignity? 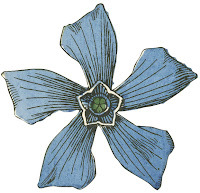 promulgated on December 31, 1930. 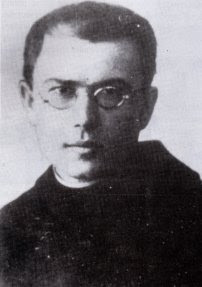 Today, the Catholic blog world will be alive with posts on one of the Church's favorite saints and heroes, St. Maximilian Mary Kolbe. He who wills only what God wills possesses all that he desires. For whatever happens to him,happens by the will of God. The Church teaches us that the Holy Souls in Purgatory are officially known as "The Church Suffering" because they are undergoing purification before entering into Heaven. There may be said to be a sort of joy in Purgatory, though, despite the suffering which largely results from an absence of God. This joy is because the Poor Souls in Purgatory are assured of their salvation. They have made it to Purgatory, so they cannot be damned to hell. 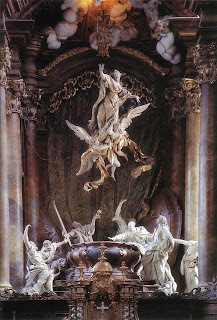 They are confident that after their stay in Purgatory, they will be permitted to enter into everlasting bliss in Heaven and will never have to undergo the permanent fires of hell. The second branch of the Church after "The Church Suffering" is "The Church Militant". We who still are working out our daily salvation are considered to be members of this group. The folks who bring us the beautiful Magnificat Magazine are sponsoring a Pilgrimage of Hope on October 11th in Boston. Pope John Paul II referred to the Christian life as "a great pilgrimage to the house of the Father" that "takes place in the heart of each person, extends to the believing community and then reaches to the whole of humanity." Magnificat has become a beloved companion to you on this journey. The Pilgrimage of Hope offers you a privileged opportunity to gather with other pilgrims from around the world, and to experience together the prayer, the beauty, and the peace that is Magnificat.